Turn your curves into your crowning glory with my Crown Jewel collection. The sensual straps frame your beauty in the most elegant way. 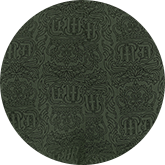 The fabric in a rich and flattering, pine green shade makes you feel like royalty. Delicate crown-shaped charms give you just the bit of sparkle that you need. Dare to bring out your inner queen!